The Blackhawk 4135 Sportster SERPA Holster is a lightweight and concealable carrying option for your handgun. Its paddle design allows comfortable, movement-free inside-the-waistband wear, and the tough polymer material makes it durable while keeping the weight low. Its minimal open-topped design provides unrestricted access to your weapon without any hoods or straps to slow you down, allowing you to draw with a firing grip for immediate readiness. Instead, it comes with the SERPA Auto-Lock retention system, which clicks into place when you reholster. It is disengaged automatically using your trigger finger during the draw, enhancing your ability to react quickly to emerging threats. Great fit for the sd40ve. I've carried the Blackhawk Serpa for years on duty and found them to be outstanding holsters. I have one that fits my G19 & G26 and one for my S&W Shield. If only they make a serpa for my Styer S9 I would be complete. Great product, love it and carry it every day. Very nice and very comfortable. I own three and they are a great blend of ease of draw, light weight, security and value. The best paddle holster out there in my opinion. I own three. This holster is my preference for soft clothes carry when concealment is not a big issue. Good combination of ease of draw, weapon retentionsecurity, easy to take on and off and good value. Use everyday and really like it. Love the serpa holster. No movement, no rattle. Fine piece of equipment. The Serpa is an all-around excellent holster. The gray color on this model is a bit of a negative, but any quality coating, like Dura or Cerakoat could remedy that. The holster rides closely, somewhat high, but not so much to be a problem. It possesses moderate concealment under jackets. Retaining the pistol securely is not an issue. And I have never found another holster faster than a Serpa. Of course, we're talking an advantage of mere tenths of a second in getting the weapon out of the holster vs. other designs. However, the Serpa can get your weapon into play twice as fast as some designs. It's natural upward draw, keeping the trigger finger extended alongside the pistol beats anything else I've tried for ease of draw and speed - especially under stress. While many LE departments and security companies may require other holsters for on duty for perfectly good reasons, this Serpa design is still in the top tier of holsters, be it for work or recreation. Comfortable and light. Everything I expected. Awesome Comfortable, great price, quick release but good hold. I own a Smith and Wesson Full-Size M&P 40 and also the 40c. Will this fit the 40c also? It should secure the compact model but there will be space between the muzzle end and bottom of holster. Have been told the Blackhawk CQC 4135 Sportster Serpa Holster will fit a Taurus Millennium Pro PT111. Is this correct? 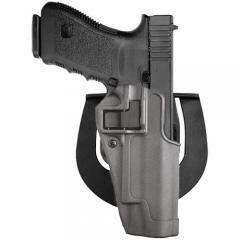 If not which, Blackhawk CQC Serpa Holster will the PT111 fit? I have not personally tested it out nor have Blackhawk confirmed it. Based on the dimensions for both guns, they do look very similar. We do have a 30 day return policy if it does not work out for you. Will this fit the 9mm 5" M&P pro. It will fit the M&P 5" barrel but the slide will stick out a bit. I have a kimber 1911 ultra carry with a 3" barrel and I was wondering what the measurements for the colt 1911 "not full length" were. The holster will fit 1911's with a 3" - 4.25" barrel length. Would this fit a Springfield XD40 subcompact? Yes it will fit full size, compacts, and sub compacts as long as it is not the XD .45. However there will be some empty space on the bottom of holster.